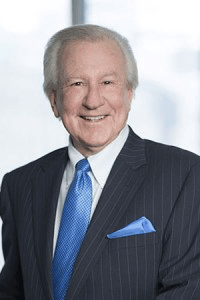 Ernie Eves is a lawyer and former Canadian politician recognized for his ability to successfully manage the interests of both government and business. As Ontario’s 23rd Premier, Mr. Eves directed the operation of the largest provincial government in Canada. Mr. Eves has had an extensive 24-year career in the public sector, including serving as Ontario’s Deputy Premier and Minister of Finance from 1995-2001. In the private sector, he has served as Canadian Vice Chairman and Senior Advisor of Credit Suisse First Boston. He has advised Canadian and International clients on investment banking, equities, and fixed income matters. Mr. Eves practiced corporate, commercial and real estate law and acted as Counsel for Borden Ladner Gervais LLP. He has served as Chair of the Ontario Olympic Sports and Waterfront Development Agency and Chair of the Ontario Investment and Trade Advisory Council. Currently, Mr. Eves serves as an advisor, consultant or board member for several firms including Gravitas Financial Inc., Gravitas Ilium Corporation, PACE Securities Corp., Nighthawk Gold Corp., YorkStreet Dispute Resolution Group Inc., Timeless Herbal Care, Asterion Bio Med Inc., Blue Nordic Partners Inc., Osoyoos Cannabis Inc., as well as several other North American and international companies. Mr. Eves has also served on the charitable boards of Special Olympics Canada and WildAid Canada and is currently chairman of the Justin Eves Foundation. Ernie Eves was called to the Ontario bar in 1972 after graduating from Osgoode Hall Law School. In 1983 he was made a Queen’s Counsel and in 2015, he received a Doctor of Laws (Honoris Causa) from the University of Windsor. With a distinguished career in both the public service and private sector, Mr. Eves looks forward to bringing his experience in governance and business relations to YorkStreet’s panel of mediators.